Let’s just say that everything I brought definitely got a few good wears. By Day 3 in Paris when I was feeling a bit better, I was so bummed that I didn’t have anything remotely interesting to wear. Sure, I had a suitcase full of basics that were very easy to mix-and-match, but I was definitely bored with what I brought. Thank goodness Hallie let me raid her suitcase! Fabulous outfit! Seems like you girls had a fun trip! Great fall outfit and such a beautiful background. Perfect! Hey! Can’t go wrong with classics! But I totally understand the feeling of boredom when you’re rushed to pack. I’m sure if Hallie hadn’t be able to share, you would have found no shortage of pretty things in the Parisian shops! Hope you had a great trip! That blazer looks AMAZING on you. Also, dying for these gorg autumn pictures!! Perfect blazer and bag! You look great in this simple, casual outfit! I love the camel blazer, and I’ll never get tired of seeing it. I love the chambray shirt underneath it. Fabulous photos! Such a fab outfit! Perfect for any occasion! Props to you on looking so put together while you were feeling under the weather! My comfy packing list would have consisted of leggings and hoodies! 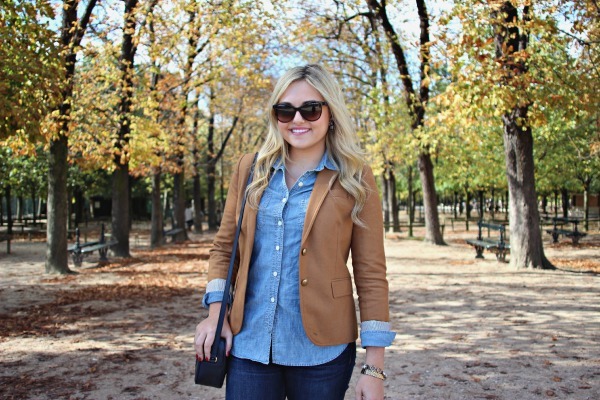 Love that blazer…it’s such a classic and goes with everything! i really like basics! i love wearing the same pieces on repeat and love that you do it as well! it is so normal!love your stylish outfit! Love those shoes! Great shade of gray! I could never get sick of a tan blazer! In fact, tan has totally been my favorite color this fall! Gorgeous look! Hi Jessica! I love the entire look. You look classic and timeless. I would wear head to toe. this is classic + chic and I love the mix of the neutrals. You look damn good girl for being sick! Love this simple and classic look! 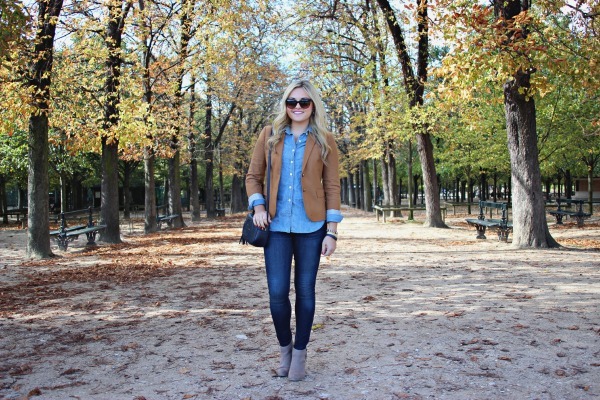 The blazer is so perfect for fall! I think this is the perfect outfit for running around Paris! Honestly, the less fuss, the better! You look great. When you’re working with minimal suitcase space and international travel, sometimes basics are really just the best — all the more reason to buy a fun scarf or amazing vintage necklace while you’re there! Such a cute outfit! This would be a great outfit to wear around campus or dinner with friends! Hope you had fun around Paris (we are all jealous). You make basics look so good! Glad you still went despite feeling so bad the first few days – I’m sure it was worth it! Great style post, Jessica. I love this simple yet classic look! 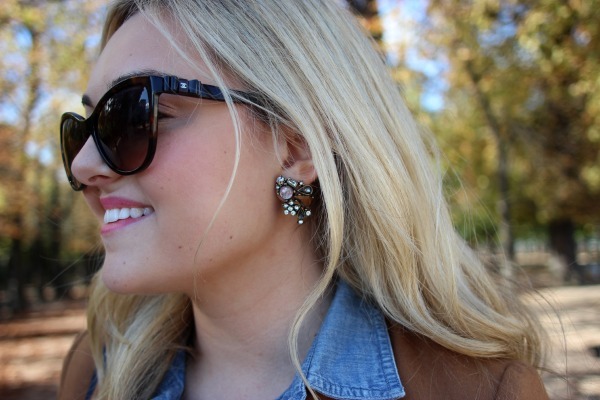 For perfect sunglasses to go with this outfit or any other fall outfit, visit http://www.framedglasses.com. Wow pure perfection! I love this look and you rock it! 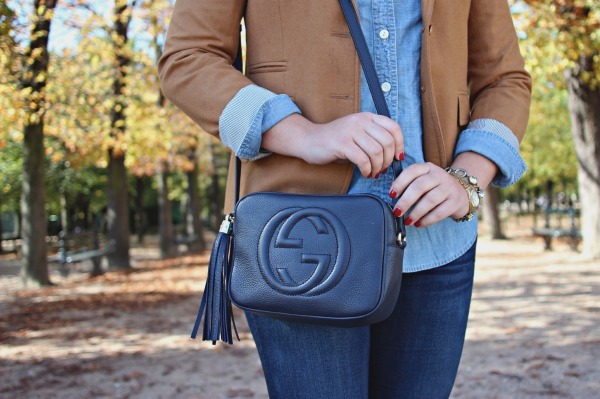 You look perfect for the autumn weather in Paris, I love your Gucci bag!! Love this look! It is so simple, but so classy. Plus, I’m a huge sucker for camel coloured blazers, and this one is great. omg I neeeeeeed those sunnies!! !